Car-sharing? What are you exactly, really? Let’s put it this way: You caught yourself in a situation where you want to run some errands but you’re missing one thing- A car. 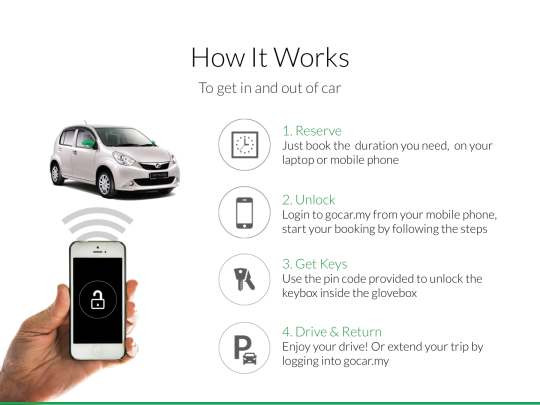 You walk out of your house and see a car parked around the corner of the neighbourhood that can be accessed by anyone who is registered with service called GoCar. You don’t exactly own a car yet you do because you still get to drive one. Magical init? Rent for the hour or day and pay for what you use. No gimmicks. Just pure convenience. Visit GoCar on http://www.gocar.my now!